Would you believe another year has gone by? That can only mean one thing. There is just 1 week left and that week is Ketchup Week. One of the most important weeks of the year because you can finally “catch up” on everything you’ve been meaning to do. 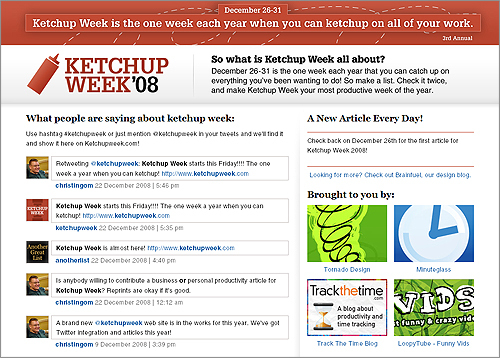 This year, we redesigned the Ketchup Week web site, integrated with Twitter and are promoting through various social media sites. Join Ketchup Week if you’re into getting things done this week.